When I had my daughter, I wanted her to wear all the adorable hair accessories I kept finding everywhere. But I didn’t realise how long I’d have to wait until she had hair long enough to hold a clip. One of the first things I made her, was a simple hair bow on an alligator clip. And it wasn’t long before she had a huge collection of pretties. 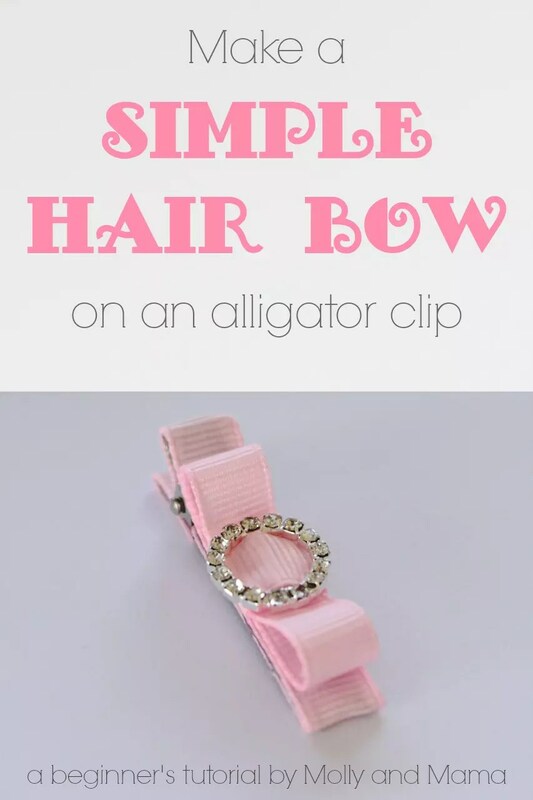 In this tutorial, I’ll be teaching you how I cover an alligator clip and add a bow with a rhinestone slider. This project is really easy and you don’t need any fancy supplies! Keep in mind that this is the method I now use after a lot of trial and error. But I’ve seen lots of different ways to make bows. You may have other suggestions and tips, so be sure to leave me a comment and let me know. From your piece of ribbon, cut three lengths – 12cm (4.75″), 9cm (3.5″) and 3cm (1.25″). Use your heat sealer to seal the ends of each piece. Alternatively, run the flame from a cigarette lighter across the end of the ribbon to melt the fibres and seal the ends. Set up your glue gun and allow it time to heat up. Don’t forget to lay down a work mat. Glue guns can get messy! If you haven’t used one before, spend a bit of time practising. And watch your fingers! Each step in this tutorial is straightforward, but will need to be completed swiftly as the glue tends to dry very quickly. 1. Have your 12cm (4.75″) length of ribbon handy. We’ll use this to line the alligator clip. Open the clip and run some glue along the underside of the top ‘jaw’ of the clip. Slide your ribbon into the open space between the jaws and attach it to the glue. If your ribbon is patterned, ensure that the back side is the side being glued. You can see my clip in image 1 below. It’s turned upside down here though so you can see how I’ve positioned the ribbon. 2. With your clip facing up, run a length of glue across the top of the clip right to the end of the jaw. Fold your ribbon back over the top and gently smooth it across the top jaw using your thumb. Your clip should now resemble image 2 below. 3. Place a small dab of glue on both ends of the inside of the jaws at the back. Be careful not to get any glue near the spring though, or you’ll have a clip that won’t close properly. Gently push the ribbon into the space at the back. You can see my clip upside down here in image 3. 4. Lastly put a small dollop of glue on the underside of the clip, just over the space where the circular hole is shown in image 3. Fold the remaining length of ribbon over and press down to secure. Your lined clip should look like image 4. That wasn’t too difficult, was it? 1. Now it’s time to create a pretty bow to pop on top of the clip. Take your 9cm (3.5″) length of heat sealed ribbon and place a small amount of glue at one end. Bring the other end around and join them to make a loop with a small overlap (as shown in image 1 below). 2. Place another small spot of glue on the inside of the overlap and press the loop down so that your bow now has two loops and looks like image 2 below. 3. Thread your 3cm (1.25″) length of heat sealed ribbon through the slider of your rhinestone accessory. You can see this in image 3 below. A small dab of glue on the back will help the stop the slider from ‘sliding’ off. 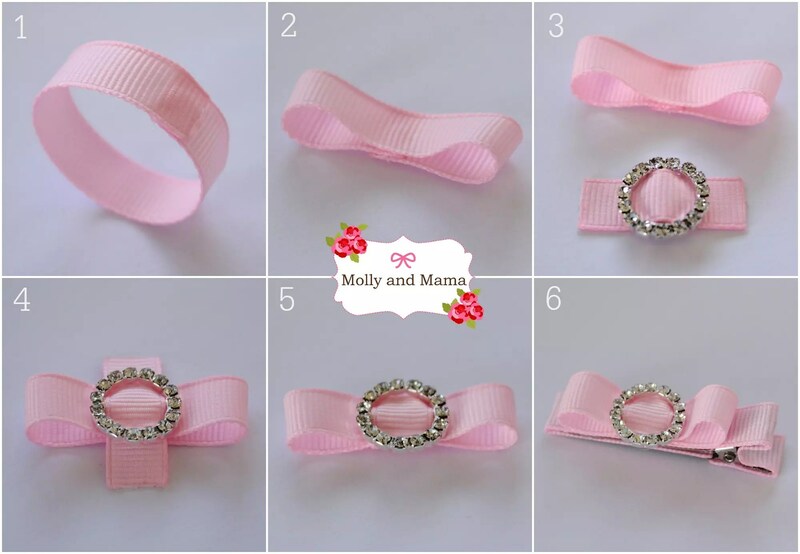 If you choose, you can also leave the slider off and just create a pretty bow without the bling! 4. Place the slider and ribbon over the centre of your bow loops as shown in image 4 below. 5. Hold the pieces together, turn them over and place a dollop of glue on the back of the bow loops. Fold each end of the 3cm ribbon over the glue to secure it to the bow loops. Image 5 shows how your bow should now look. 6. 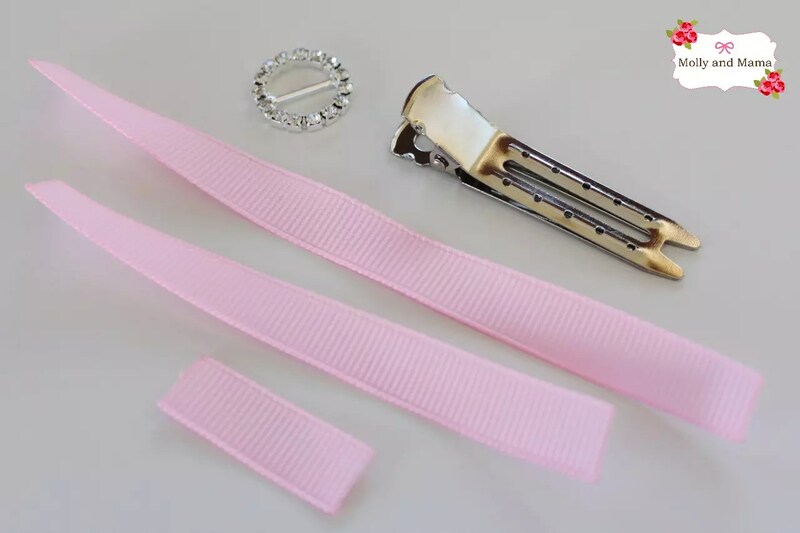 Now all you need to do is attach the pretty bow to your clip. Run a short length of glue along the centre of the top jaw of the alligator clip. (Don’t run the glue along the whole length of the clip top as the bow won’t cover that far). Gently press your bow in place and your pretty clip is all complete! When making hair accessories, I also like to add a non-slip grip to the underside of the top jaw. It’s a small self adhesive strip of thin pre cut foam that helps the clip to stay put in fine hair. It’s a useful addition but not a necessary one though. 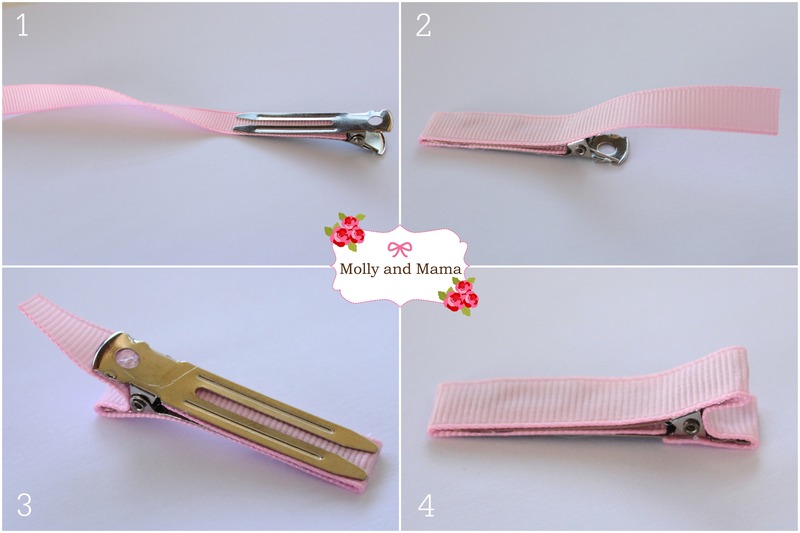 So there you have it – a very simple bow on a ribbon lined alligator clip! Now that you’ve made one, you can create a whole collection! Here’s a few that I put together for a very special photo shoot! A big thanks to MiaMia Photography for the beautiful image. You can see more bow inspiration on my Pinterest board for Hair Accessories. You might like to try your hand at some of the other hair bow and accessory tutorials I have too! 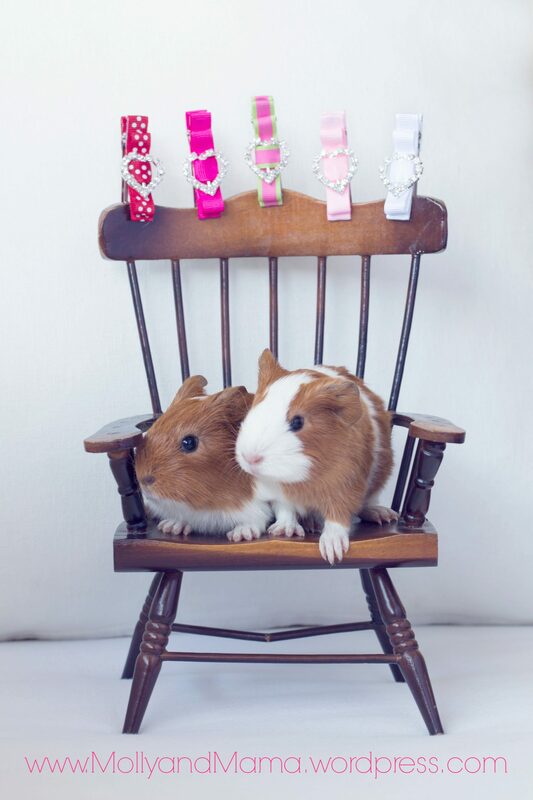 And then you can create a Hair Clip holder to store them on! I’ve created a tutorial for this too, so make sure you head over and have a look. You’ll be surprised at how easy this is too! Thanks for stopping by once again. I hope you’ve picked up some ideas and inspiration today! Hi Ashlynn, thanks so much for asking. 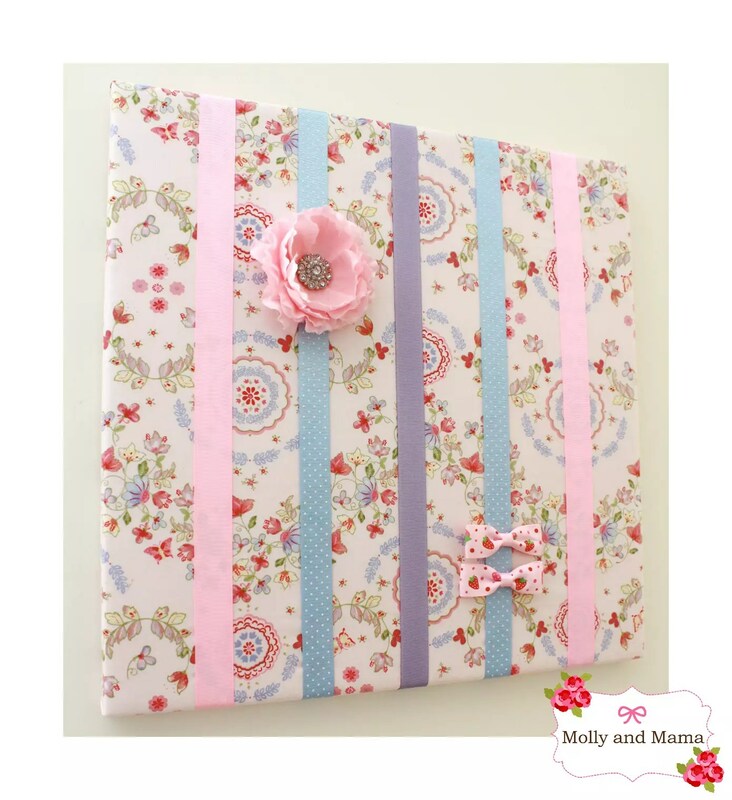 I’d love for you to feature Molly and Mama on your website. And I’m a pinterest addict, so I’ll see you there! I appreciate the support, Lauren.